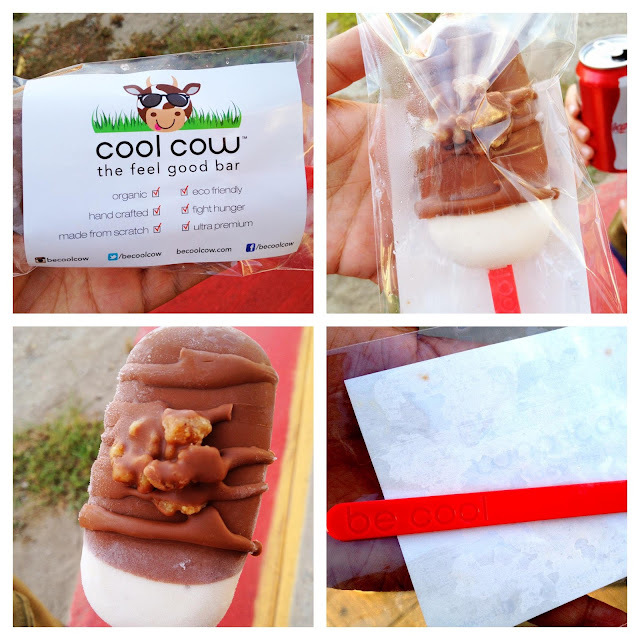 There's a new dessert truck on the Food Truck scene and they go by the name Cool Cow! This eco-friendly truck is serving up some delectably decadent gelato, sorbet and yogurt bars for your sweet tooth's pleasure! Oh, and did I mention all their bars are organic and even offer vegan options? So it's like you're totally being healthy! The message of the Cool Cow Dessert Truck is simple. Develop "Feel Good Bars" that aren't only delicious but that appeal to everyone! By using fresh, organic and vegan ingredients these bars make you and your body feel good and these DEFINITELY had me feeling good. The first gelato bar I tried was the "Be Ape" bar. This bar is banana gelato based, dipped in milk chocolate and topped with walnuts. Imagine Ben and Jerry's Chunky Monkey pint in bar form. Just think about how epic that would be, to be able to take your favorite pint around with you while you dessert it up to your heart's desire. This bar is exactly what that would be like. The best thing about Cool Cow's banana gelato is the fact that it doesn't have that fake chemical tasting banana flavor, or what I like to call faux-nana. They use fresh organic fruits and you can TASTE it. My only complaint about this bar is that I would have loved more walnuts. Maybe just add those crushed walnuts into the banana gelato? That would take this thing to the next level. Be Caliente. Be Exquisite. Be Awesome. I just had Cool Cow again at The Yum! 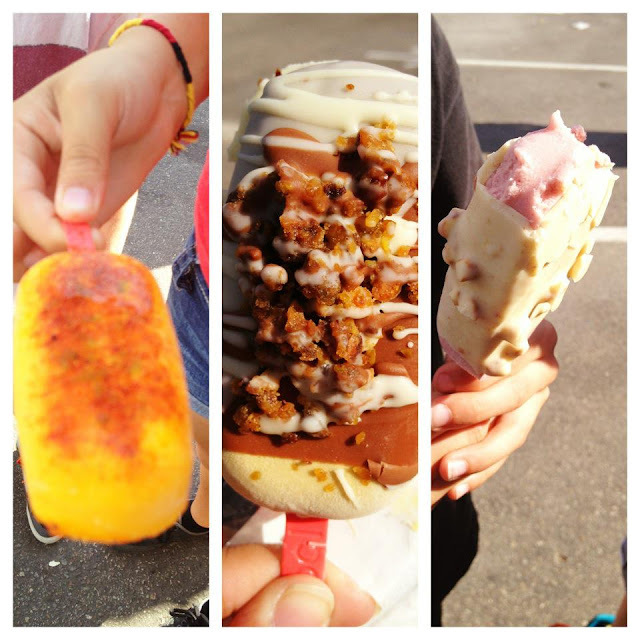 Festival and brought my little brothers and cousin to taste the amazingness for themselves. My cousin got the "Be Caliente" bar, a mango sorbet bar covered in chili powder and dusted with some lime zest. Think of those chili mango suckers the ice cream man used to sell and that's what you have but in frozen form. My cousin said it best when she described it as: "Icy, spicy, sweet goodness, with chunks of real mango!" She was mad that these aren't sold in stores as she declared it her new favorite thing EVER. My little brothers tried the "Be Awesome" bar, strawberry gelato dipped in white chocolate and topped with crushed pretzels. I had a bite and thought Cool Cow had created the most delicious and fresh tasting strawberry ice cream or gelato I had ever tasted. You could actually feel the grittiness of the strawberry seeds in the bar. The pretzels added a nice subtle salty component while the white chocolate a nice pair to the strawberries as it wouldn't overtake it as the main star, where milk chocolate would have. The bar was ridiculously good, that is, until my brothers were fighting over who would take the next bite and ended up dropping it in the dirt. SUCH A WASTE. I decided to switch it up this time and try the "Be Exquisite" bar, pistachio gelato, dipped in milk and white chocolate and topped with candied pistachios. This was quite a fancy bar indeed. The pistachio gelato wasn't an intense pistachio flavor like I would have preferred but I know not everyone is a pistachio fiend like I am. The milk and white chocolate played against the salty sweet pistachios in such a lovely way that I forgot that I was mad about the gelato. I definitely finished the whole stick and licked it clean. No shame. The upside to cleaning that stick, besides getting all the delectable gelato off it, is the fact that the Cool Cow truck donates 25 cents to help local charities fight hunger in communities! Also, that cute little stick is 100% biodegradable! So the next time you see that adorable looking baby blue truck with the cow spots stop whatever you're doing and head on over to order yourself one of these amazing bars. Trust me, you won't be disappointed!